HIGHLY RECOMMENDED (AUS) (Bay 2008-Stud 2013). 2 wins-1 at 2-at 1000m, 2050m, MVRC Alister Clark S., Gr.2. Brother to SW Undeniably. Half-brother to SW Sky Cuddle (VRC Emirates S., Gr.1), SW Sky Love and SW Hint. 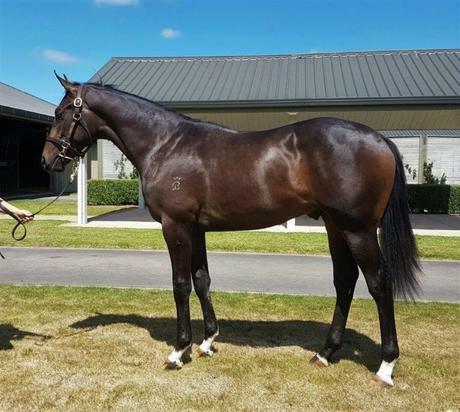 Sire of SW Sumstreetsumwhere (Waikato RC James & Annie Sarten Memorial S., Gr.2), Waldorf, SP Joyfilly (Ours), Pipiana, Kirkland and of Greenpark Gem, Vishnu, Beneficial, Stylish Applause and of the placegetters Ophelia Rose, Commended, Politely, etc. His oldest progeny are 3YOs. LAMINGTON COUP, by High Chaparral. Raced twice. Half-sister to Darci Coup, Salsify (dam of SALSONIC). Dam of one named foal. Darci Coup (Darci Brahma). 8 wins-1 at 2-from 1000m to 2000m, NZ$107,250, Gore Cup, CJC Speight's H., Piccadilly Books & Postshop at Avonhead Mall H., 2d Otago RC Dunedin Gold Cup, L, CJC Farmers Mill H., Dunedin Gold Cup Trial, Avon City Ford H., 3d CJC Greenacres Stud 2YO H.
Prince Nimrod. 7 wins-2 at 2-to 1200m, A$103,240, STC Baiada Select Poultry H., 2d STC Rooty Hill RSL & Club Resort H., 3d AJC Tantieme H., STC Australian Mortgage Options H.
Coup Anabaa. 4 wins at 1100m, 1200m, 2d Otago RC Otago Tyres H.
Giteau - My Hurricane (Sing.). 3 wins-2 at 2-at 1100m, Singapore TC Class 4 H., 3d STC De Bortoli Wines H.
Kirinata (Stratum). 8 wins-1 at 2-from 1200m to 1600m, A$206,965, ATC Chiko H., Gujadhur Mauritius Ltd H., 2d ATC Rosehill Gardens H., 3d ATC South Pacific H., L, Rosehill Gardens Event Centre H.
Syamantaka Mani. 4 wins from 1350m to 1600m to 2017-18, BRC Recon Solutions H., 2d Ipswich TC Optus P., SCTC XXXX H., 3d BRC Gallopers Sports Club H., SCTC Sky Racing P.
Meghapushpa. Winner at 1200m in 2016-17, SCTC Hahn Super Dry P., 2d BRC Gallopers Sports Club H., Ipswich TC City of Ipswich P., 3d SCTC HMR Projects Pty Ltd P.
DANCING DYNAMITE (Yeats). 7 wins-2 at 2-at 1200m, 1400m, A$308,770, VRC Crown Casino S., Gr.3, Qld Tatt's RC Mercedes-Benz S., L, AJC Alan Potter H., STC Citius Welter H., AJC Boys' Town 2YO H., 2d AJC Stan Fox S., Gr.3, STC Skyline S., Gr.3, Gosford RC Pacesetter S., L, 3d STC Theo Marks H., Gr.2, AJC Brian Crowley S., L, June S., L.
Nimble Feet (Zoffany). 3 wins. See above. Winter Guest. 15 wins from 1200m to 1900m, A$107,882, TTC Liquor Less Winter Series H., City of Launceston H., Nu-Bake Wonder Muffin H., TRC Tasmanian TAB H., Governors Cup, TTC Sunday Examiner H.
Cheshire. 10 wins from 1200m to 2000m, A$182,628, AJC Korean Industry Flying Welter H., Avenium Flying Welter H., NSW Tatt's RC Club Welter H., STC Redcraze Welter H., AJC Kingsford H., STC Hibiscus H.
Cointreau Ball (Snippets). 6 wins to 1550m, A$113,150, MRC Flinders H., SAJC Feltex H., Christmas Twilight at Cheltenham H., Bell Potter Securities H., Seppelts Fleur de Lys H., 3d SAJC Queen Adelaide S., L.
RAZAMATAZ (Prego). 10 wins to 1200m, A$188,240, SAJC Malaysia Airlines S., L, Barossa Under Stars H., AJC Ming Dynasty H., 2d SAJC DC McKay S., Gr.3, Oakbank RC Clipsal S., L, SAJC Little Slam H., AJC Silver King H.